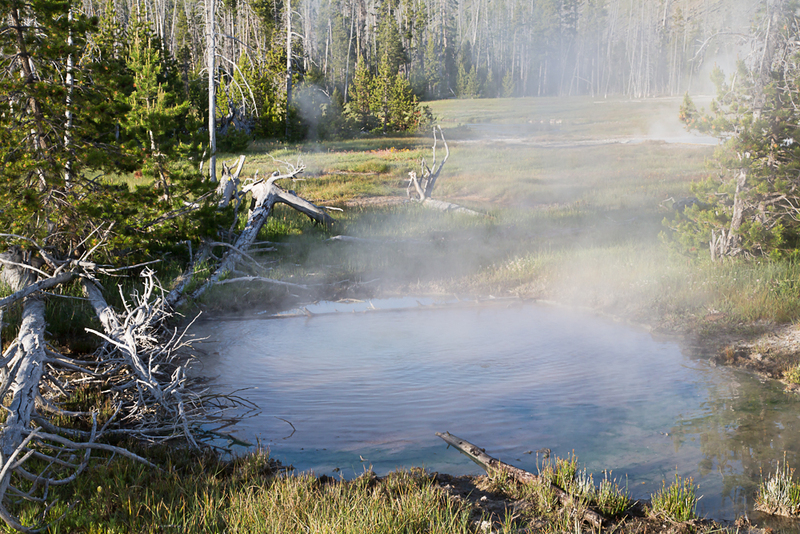 The last stop on our Rocky Mountain marathon was Yellowstone National Park. 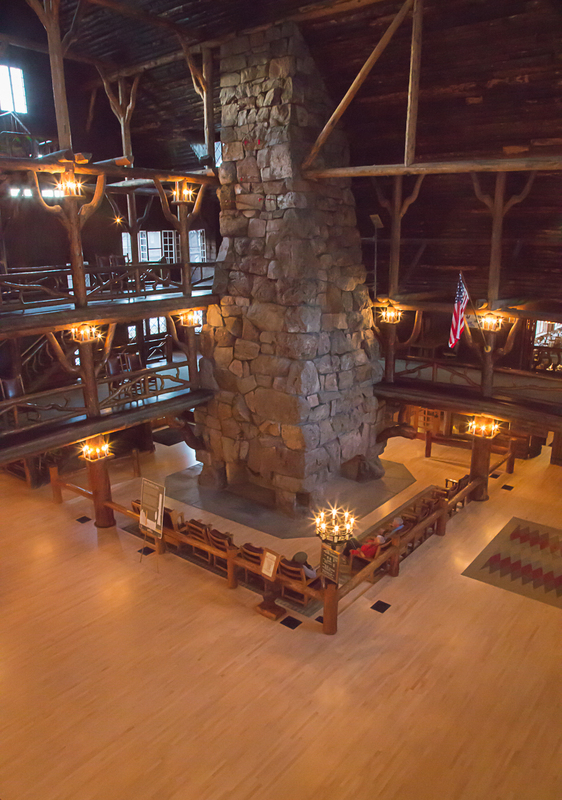 We have been there many times, but we have never stayed at the Old Faithful Inn, so that was one of our main objectives on this visit. 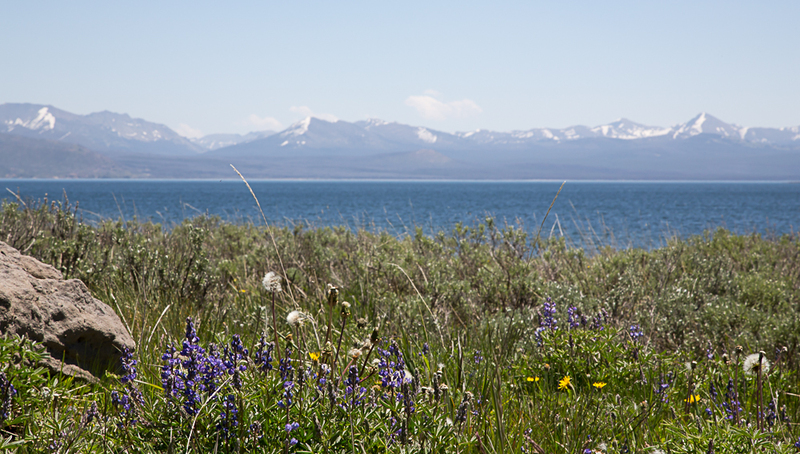 It is a several-hour drive from Glacier to Yellowstone, but the scenery is so absorbing that the time passes quickly. Montana is gorgeous, and there are many spectacular mountains beside those in Glacier. The plains are beautiful with rolling hills, great green pastures, and trim ranch houses. As we got closer to Yellowstone, the mountains and forests again took over the view, and we saw several of the famous and beautiful rivers that have inspired writers, painters, photographers, and fly fisherman from as far back as Lewis and Clark – The Yellowstone, the Gallatin, the Madison – and we would soon see the Fire Hole. West Yellowstone was like all of the entry villages of national parks, crowded with tourists and filled with ice cream stores and curio shops. Yet once inside the park, the beauty became overwhelming. Many wild animals, rushing streams, perfect vistas, and far-away mountains. 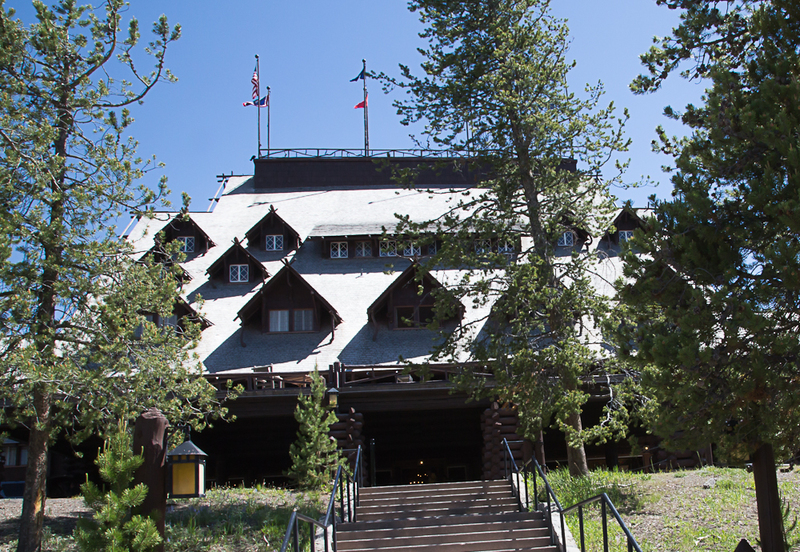 We arrived at Old Faithful Lodge in the early afternoon. Parking lots were full, the lobby was jammed, and there was a long line of people waiting to check in. Once we arrived in our room, it was like stepping back in time. Our room was in the Old House, the iconic lodge famous in pictures and opened in 1904. The room had been updated a bit, but we still had to go down the hall to the communal bathrooms. That was a seeming inconvenience which we soon took in stride for the pleasure of staying in this historic and wonderful lodge. Back in the lobby, we gasped with the other tourists at the enormity of space. 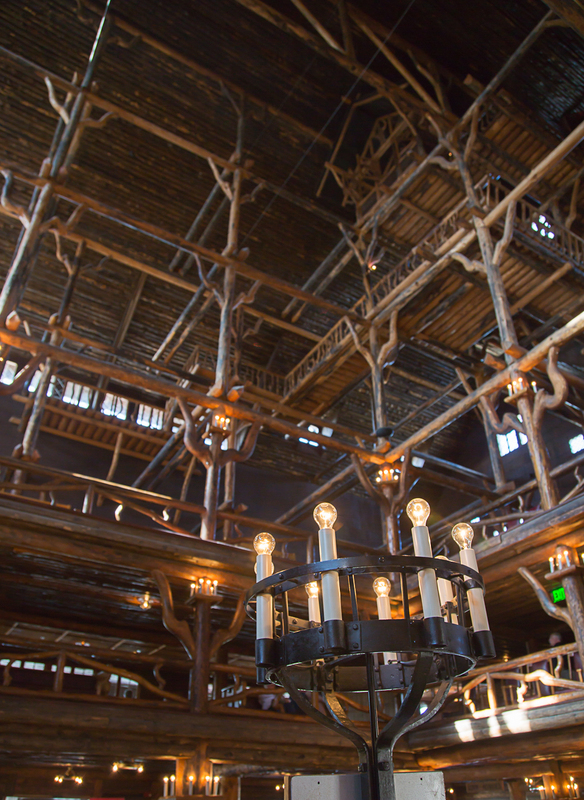 The log ceiling reached up many storeys nearly 80 feet above the lobby floor with the massive stone fireplace serving as the focal point. The detail was inspiring. 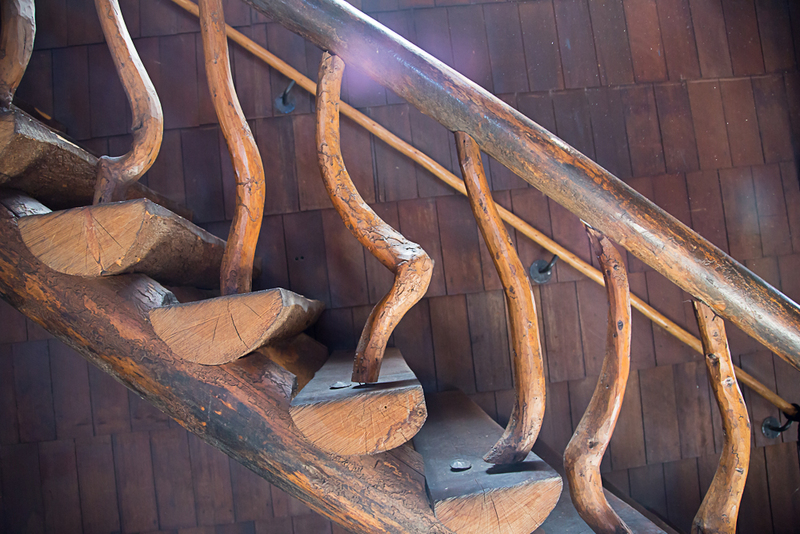 Each staircase was a work of art with twisted pine limbs serving as the balusters. Similarly the supporting posts on each floor were carefully matched twisted limbs. Even the outside supports on the verandah were carefully matched and polished to a sparking gloss. Later, I found that the best time to enjoy the beauty of the lobby space was at 4 AM when all the lights were still ablaze but the visitors had gone to bed, and the cooks were not yet awake. We learned another thing, too. 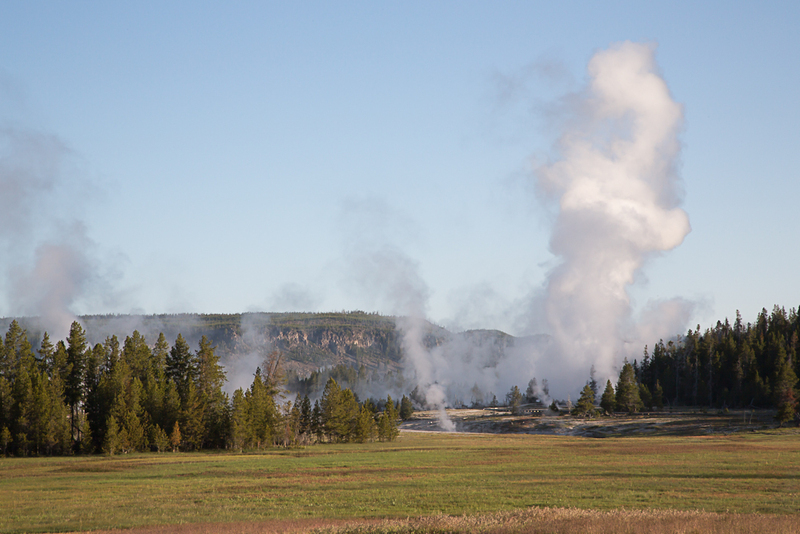 We arose at dawn each day of our visit to visit the geyser basins, lakes and rivers. The wildlife was out, but the tourists were still asleep, and we had the park nearly to ourselves. By noon, the crowds had awakened and the crush of humanity was almost too much. Steam rose from the geysers. 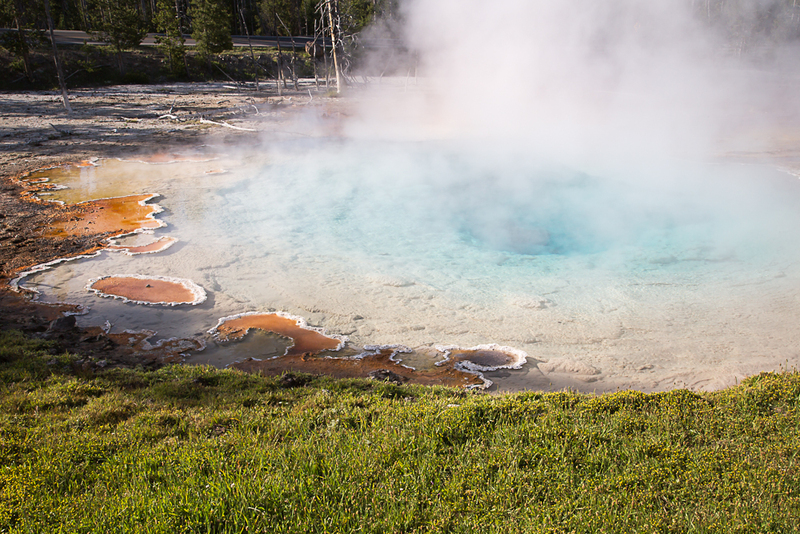 Crystal clear water glistened in the hot pools lined with colors of emerald, pink, and cobalt blue. 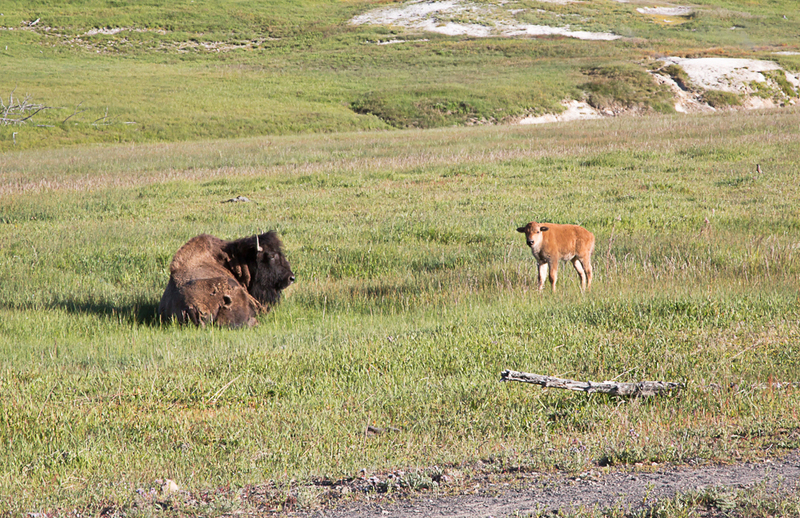 Mother bison were tending their calves along the roadside, and deer and elk hid in the shadows of the forest. We did not see any bears, but our wildlife experience was still thrilling. Watching Old Faithful Geyser erupt was a treat as we sat on the verandah with gin and tonic in hand . The big disappointment was eating dinner in the dining room. The room was beautiful, and it had been preserved and restored to its early glory. One tried to imagine early visitors dressing for dinner with the women in long gowns and the men with stiff collars and suit coats. The vision was impossible to hold in an atmosphere of very large men in short shorts and their equally large wives in fluorescent tube tops. 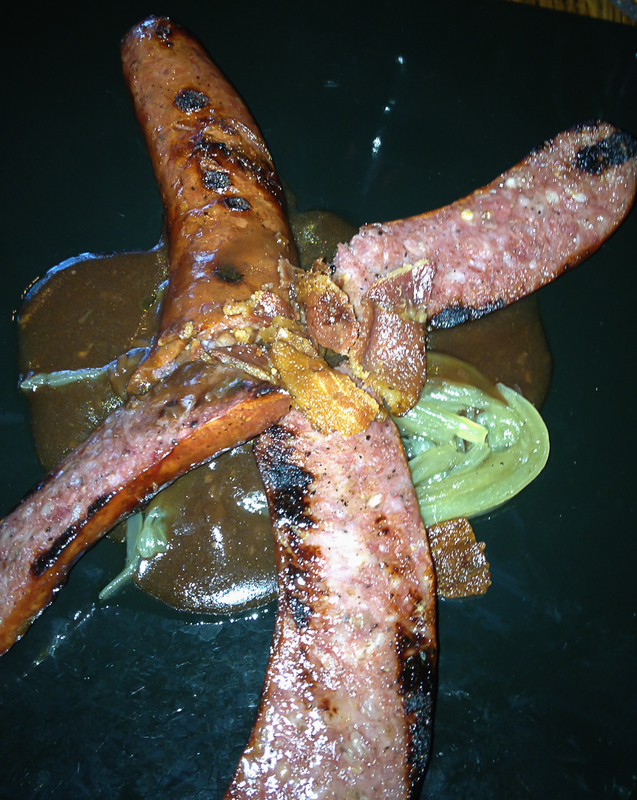 The menu was filled with interesting-sounding choices, but that seemed like a waste of time as the very large men made repeated return visits to a buffet. The food was ok, considering the huge number of meals served each day, but it didn’t match the surroundings (sans tourists). 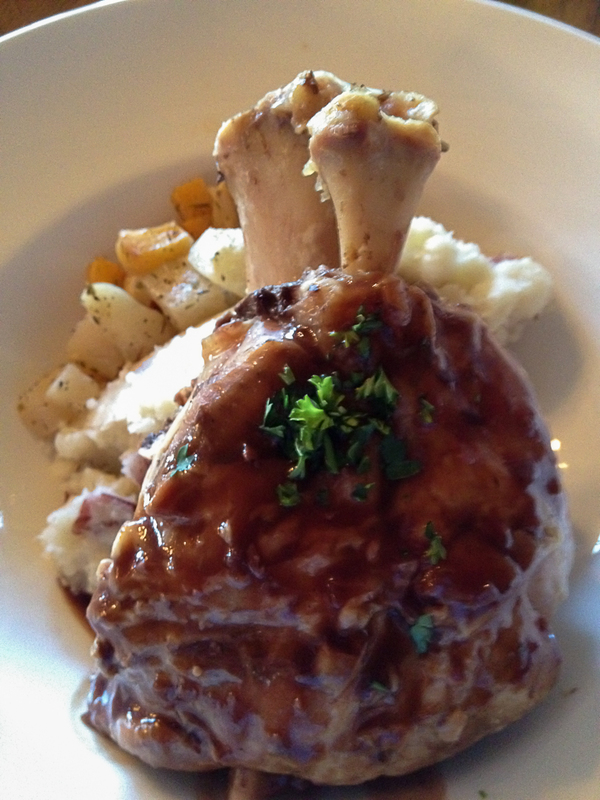 Among the dishes we chose were shrimp risotto, trout cakes, antelope sausage, and pork osso buco . 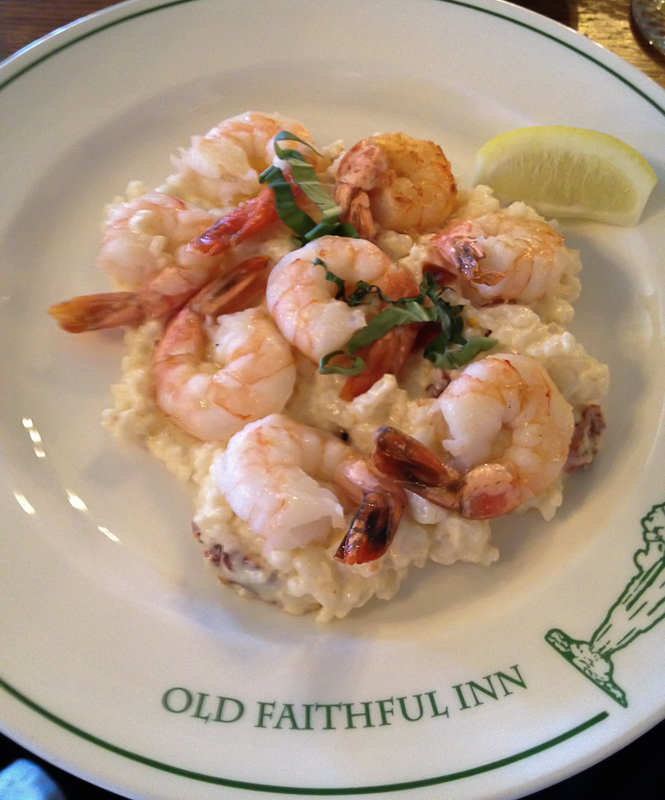 Of these, I have tried to replicate the shrimp risotto. In a large pot, bring the vegetable stock and 1½ cups of water to the boil. Add the carrot, celery, white onion, garlic, parsley, peppercorns, and salt to the boiling water. Simmer for 30 minutes. Squeeze the tomato into the pot and drop in the skin and flesh. Continue to simmer for another 10 minutes. Add the shrimp, return to a full boil for 5 minutes. Remove the shrimp, peel, and chill. Remove the stock from the heat, strain, and then return to the cleaned pot. Add 9 cups of water to triple the volume of liquid. Reheat to boiling. In the meantime saute the mushrooms in half the butter (3 tablespoons) in a small skillet over medium heat. 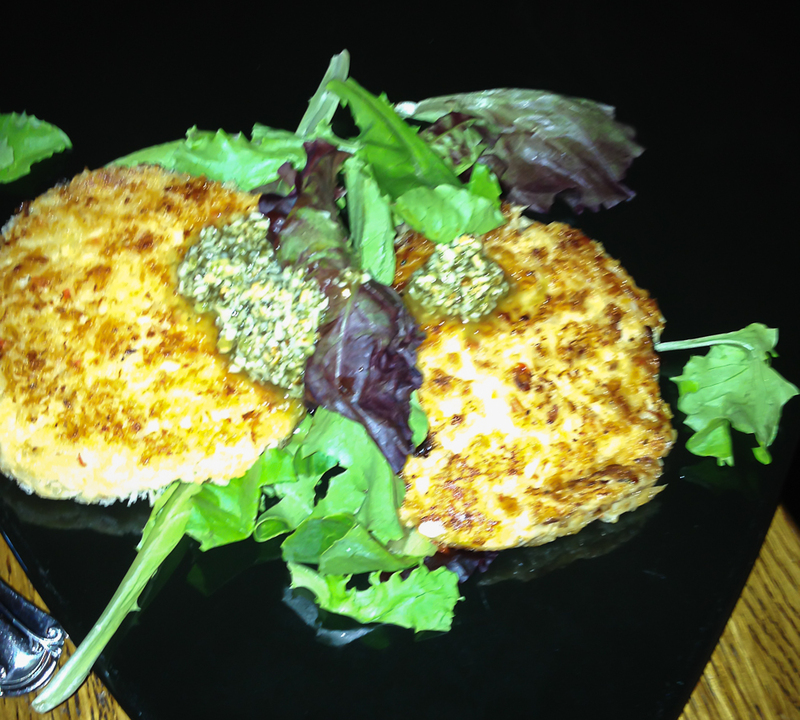 Set aside in the skillet. In a medium saucepan, melt the remaining butter. Then sweat the onions in the melted butter, covered over medium heat. When the onions are translucent but not browned, add the rice and cook, stirring constantly, until the rice grains become opaque but not brown. Turn the flame under the rice mixture to high and immediately add one ladle-full of the boiling stock. Stir constantly until the liquid is absorbed. Add another ladle of the stock and continue the process of stirring and boiling until the rice is soft and creamy, about 30 minutes. Correct the seasoning with salt and pepper. 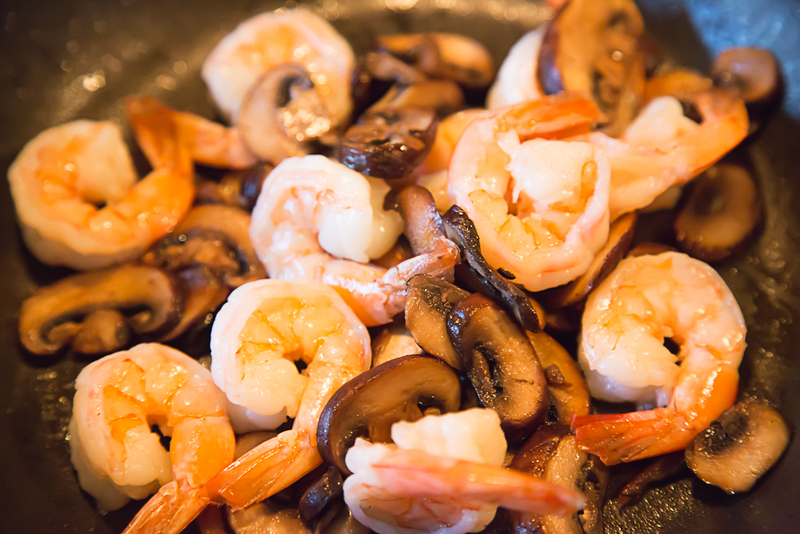 When the rice is nearly cooked, add the cooled shrimp to the skillet with the mushroom and heat over a medium-low flame. Serve the finished risotto in 4 soup bowls. 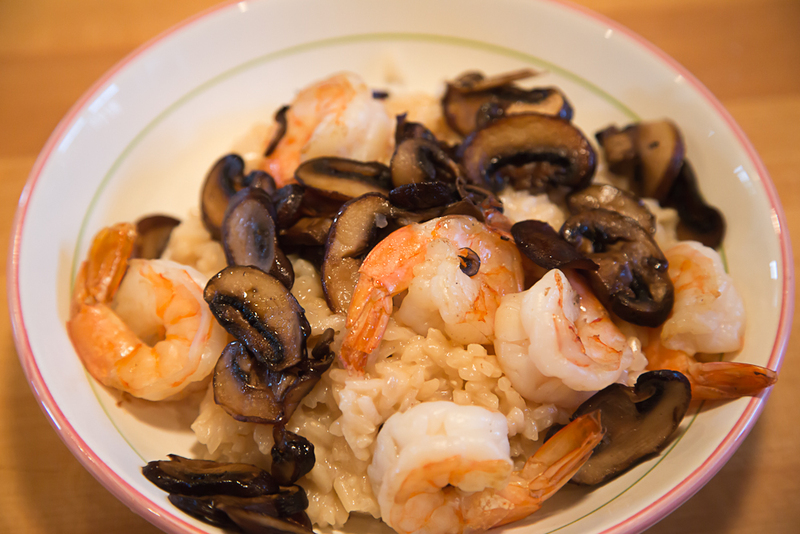 Divide the mushrooms and shrimp into four servings each, place on top of the risotto and serve immediately.